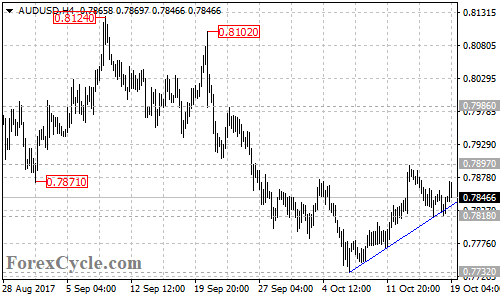 AUDUSD rebounded from 0.7818 after touching the rising trend line on its 4-hour chart, suggesting that the pair remains in the uptrend from 0.7732. Further rise to test 0.7897 resistance could be expected, a breakout of this level could signal resumption of the uptrend, then next target would be at 0.7986. Key support is now at 0.7818, only break below this level could indicate that the uptrend had completed at 0.7897 already, then the following bearish movement could take price back towards the resistance-turned-support trend line on the weekly chart.